This week's edition of Ready For The Weekend shall be seeing us firstly heading to Bristol for ATTACK! at The Trinity Centre. Then we're off to Leicester for a stacked LCW event before we round off the wrestling weekend in London at the Cockpit Theatre for RevPro. Phew! Right that's the itinerary out of the way, let's get Ready For The Weekend! The weekend kicks off on Friday night when ATTACK! Pro Wrestling cross the border into England and head to The Trinity Centre in Bristol for 'RaffleMania II: Stripwrecked'. The event will see the continuation of the ATTACK! Championship tournament with an opening round contest between Mike Bird and Zack Sabre Jr taking placing. These men are both well known to the Attack! Pro Wrestling fans with Bird being a foundation of the promotion while ZSJ's star continues to shine brighter with every passing week. Bird has finally put his issues with "Flash" Morgan Webster to bed and will be looking to focus now on winning some championship gold. However, he'll have to bring his all against ZSJ who is currently in the WWE Cruiserweight Classic as well holding the top titles in PWG & RevPro. ZSJ will be looking to add more accolades his to resume but a win for Bird would be a huge statement to everyone else in the tournament. Speaking of the tournament, Wild Boar and Eddie Dennis have already secured their place in the next stage of the tournament. They could find themselves as tournament opponents in the near future, but this Friday they shall be on opposing teams when Boar and CCK's Chris Brookes and Kid Lykos face the trio of Dennis and The Brothers of Construction in six-man tag team action. The B.O.C. and CCK also have previous between them. CCK won the Attack! Pro Tag Team Championship from The B.O.C., who have yet to get the chance at getting the gold back. A win for The B.O.C. could slingshot them straight back into the title picture. There is a lot of variables in this match with tournament competitors and tag teams fighting over gold. Could go either way this one. This Friday will also see a rematch from Attack! Pro Wrestling's last event at Walkabout in Cardiff as Tyler Bate will compete against Travis Banks. These men tore the roof off Walkabout last time so we hope that The Trinity Centre in Bristol have checked theirs as we could see history repeat itself once again this Friday. 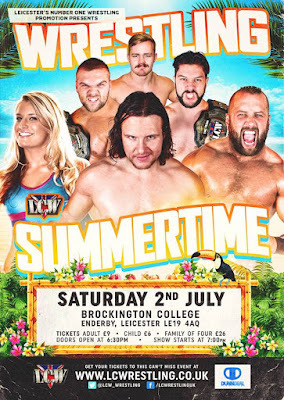 Moving on to Saturday and Leicester Championship Wrestling are at Brockington College in Leicester with 'Summertime 2016'. At LCW's last event, 'Aftermath', White Tiger defeated LJ Heron and in the process became the number one contender for the LCW Young Guns Championship. Well now he is going to get his chance to win the championship when he faces TK Hayward this Saturday. The LCW fans have been behind Tiger for a long time and have wanted him to have this chance. Hayward has went to great lengths to remain champion and he'll be looking to do the same on July 2nd. Only time will tell whether Tiger and his unanimous support will be enough to dethrone the current champion. Alexis Rose and Toni Storm have been at each other's throats for a number of months now with wins being exchanged back and forth. Rose wants another match with Storm and she's going to get it but with the added elements of Xander Cooper as her partner and Tyler Bate joining with Storm. While Cooper may be a help to Rose, Bate is an equal counter to that advantage. The Rose and Storm rivalry looks set to create another chapter this Saturday. 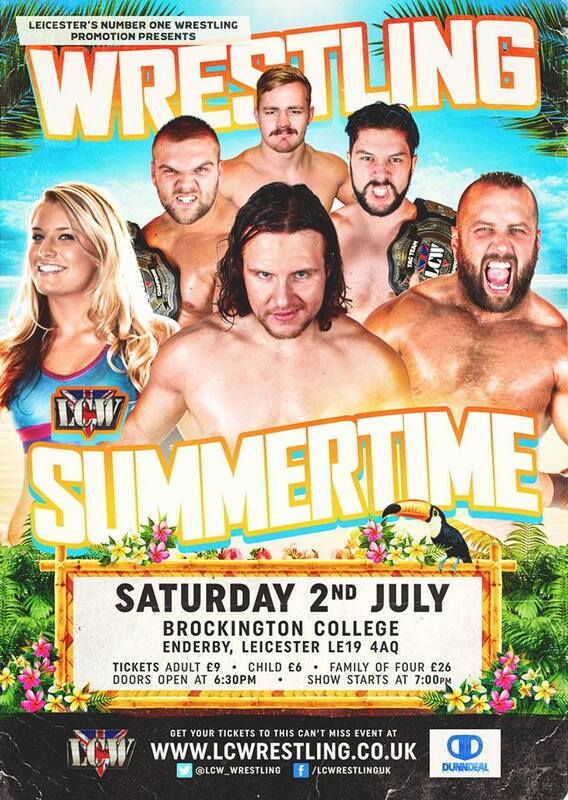 The main event this Saturday will see the current LCW Heavyweight Champion; Stixx in action when he joins with Joseph Conners to challenge Cy Gregory and Marc Massa of DNA for the LCW Tag Team Championship. The match was made a few weeks ago after Gregory failed to win the LCW Heavyweight Championship from Stixx. DNA are indeed a very slick team, hence why they are champions, however their opponents have both held the LCW Heavyweight Championship, Stixx being the current champion. DNA winning would be a huge feat for them and something they would no doubt be sure to boast about. If Stixx and Conners win, they could well become the most dominant team in LCW history. Ladz Ladz Ladz (Zak Northern & Gabriel Kidd) vs ??? Finally we round off the wrestling weekend in London at the Cockpit Theatre with Revolution Pro Wrestling. Amazingly this will be the tenth event that RevPro have held at the Cockpit Theatre in what seems like still a new venue for the promotion. The match card for the show however feels very familiar with it being stacked full of British stars. For a number of weeks, The Legion Of Lords' Rishi Ghosh and Lord Gideon Grey have been campaigning for an Undisputed British Tag Team Championship match. This Sunday they will get their wish when the challenge Charlie Garrett and Joel Redman for the gold. The L.o.L. truly believe they are the best and their run of wins can't be argued with. The champions can't be dismissed easily either though as they defeated the longest reigning champions in RevPro history to become the champions. The L.o.L. want championship gold badly, Garrett and Redman will have a real test of their hands to show they want to remain champions even more. Originally at RevPro's last event at the Cockpit Theatre, Mark Haskins was scheduled to face Trent Seven. However due to illness, Haskins was not able to compete and the match did not take place. This Sunday, Haskins is back and he's 100%! Add in the element and Seven also bring his A game any time he's in the ring and we have the makings of a show-stealing match when The Super Don faces The Star Attraction. 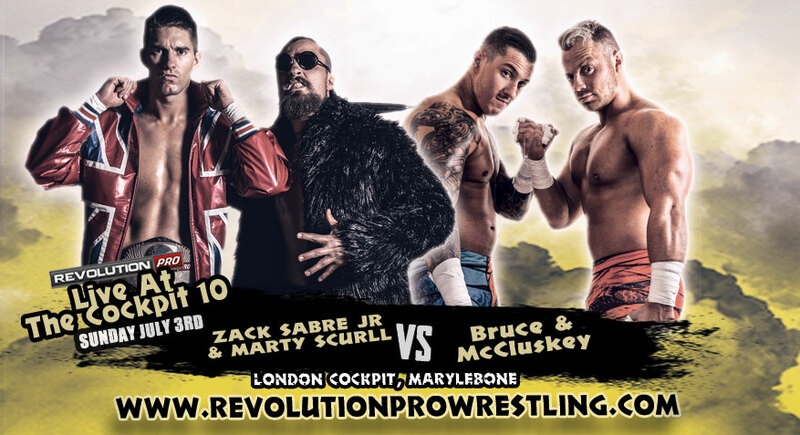 The main event this Sunday will see the current Undisputed British Heavyweight Champion; Zack Sabre Jr join forces with the number one contender to the champion, 'The Villain' Marty Scurll in a reformation of The LDRS. Their opponents will be the duo of Jake McCluskey and Kieran Bruce. McCluskey and Bruce are a slick tag team who have found success in various locations in England. 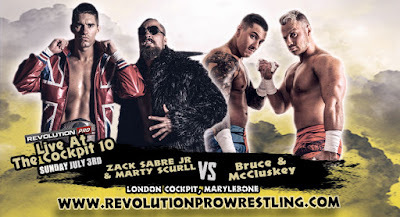 This will be the biggest match of their career but the one chink in the armour of the The LDRS is the relationship between Scurll and ZSJ right now. Scurll's actions of late have been questionable and not to the liking of ZSJ. Scurll has told his partner that there is nothing to worry about but does the champion 100% believe that and trust 'The Villain'? We might find out this Sunday.